Years ago I owned a retail business that I ran from my home. I had a small shop in my finished basement and I would hold regular open houses for local clients as well as ship orders from online sales. I carried a wide array of items that were related to both wine and entertaining. That’s right…wine. This was BC (Before Cocktails) which are now my passion. One of the things I loved were these small jars of fantastic jelly made from Pinot Noir, Cabernet Sauvignon, Chardonnay or Rosé wines. While I used to have a ready supply, I haven’t had any in a couple of years and I was inspired to try making my own for this month’s Progressive Eats group event. Jenni Field with the blog Pastry Chef Online is the host for this month’s event and has chosen the theme of Wine and/or Cheese. This is amazingly simple to do and while I’ve made Pinot Noir Red Wine Jelly this time around, use the same recipe for your favorite wine whether it be red or white; this one was fantastic so I’m looking forward to trying other variations too. It could not be simpler even if you are not someone who does canning on a regular basis. It only made a little more than 4 jars so if you don’t want to put them in a hot water bath, just give the extra jars to friends and don’t bother with that step. The only thing I’ve done differently this time around was to follow a tip I saw on an episode of America’s Test Kitchen. A bit more than a cup of the wine is reduced considerably and then added back in at the end; that really does help to intensify the flavor. Before a client sent me a tall, large stockpot I just used my largest regular stockpot for the hot water bath. I found canning racks that fit in the bottom of my stockpot and it makes the perfect vessel for the amount that I do. These are actually cooling racks for cakes but I bought them for canning and was happy to have something with a multiple use! Some jars and a jar lifter and I was set without having to spend a ton of money on a large canning pot that I had no room to store. I used a bottle of Mark West Black Pinot Noir for this recipe. I think Pinot is the perfect type of wine for a project like this and this wine, with aromas of ripe black plums and blackberries along with mocha and vanilla notes, brought a great flavor profile to the mix. I don’t recommend that this is the recipe for a cheap bottle of $3 Chuck either; use something you would enjoy drinking but without breaking the bank. Try something in the $8-10 bottle price range. My only regret with this wine is that after I tasted it I poured the entire bottle into the pot. What was I thinking…I should have saved a small glass to drink while I cooked! It’s rich and smooth and a great pour. This jelly is not something I would normally just spread on toast; I prefer it served with fluffy homemade biscuits or even better as part of an appetizer as shown in this post. 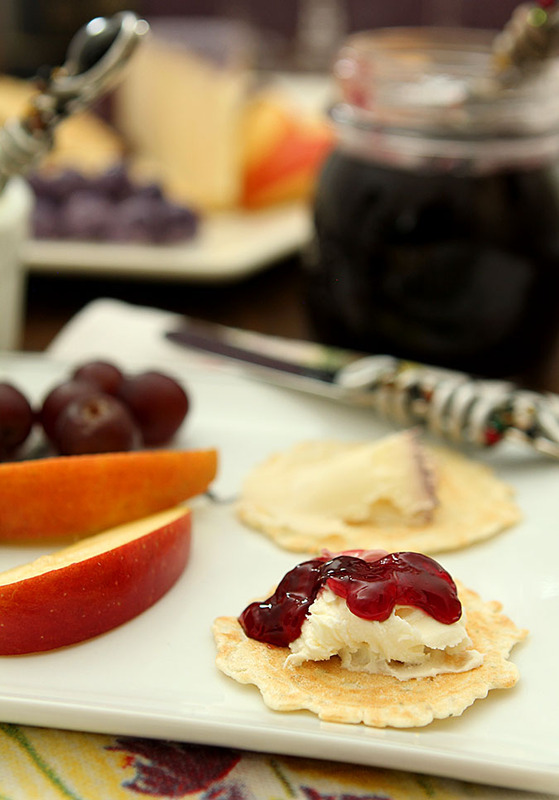 The combination of crisp cracker, Mascarpone Cheese and this Pinot Wine Jelly was addictive. Seriously I considered sitting down at the kitchen table with a jar of jelly, the cheese and crackers and a glass of water for lunch. Nothing else. I stopped myself but really…I could have! Want to surprise someone with a great homemade gift? This would do quite nicely. Mother’s Day is coming up and I can promise you this…mom’s LOVE something from the heart. They really don’t need perfume or lotions or another scarf. You show up with a gift basket with some cheese, crackers, a bottle of nice wine and this jelly and if you think they love you now? Watch out…you will totally slay your mom; I promise. Make sure you check out my friends contributions to Progressive Eats this month after the recipe. Such a talented group of people; each and every single month I wish we were neighbors and could actually share the bounty from our combined efforts. Bring 1¼ cups wine to boil in small saucepan over medium-high heat, and cook until reduced to 1/3 cup; approximately15 to 20 minutes. Set aside. Add remaining wine and sugar to a large saucepan and bring to a boil, stirring frequently. Stir in pectin, lemon juice, and butter, and return to vigorous boil, stirring constantly, for 1 minute. Remove from heat and stir in the reduced wine. Using hot, sterilized jelly jars, fill jars just to rim; add lid until just tight and let cool to room temperature before refrigerating. To be fully set, put in refrigerator to cool overnight. Jelly can be refrigerated for up to 1 month unless processing for longer storage. Transfer jelly, while still hot, to hot, sterilized 1-cup jars, leaving ¼-inch headspace. Wipe rims before putting on lids and tighten lids just until snug. Store in cool, dark place for up to 1 year. Welcome to Progressive Eats, our virtual version of a Progressive Dinner Party. This month’s theme is Wine and Cheese and is hosted by Jenni Field, who blogs at Pastry Chef Online. For our Wine and Cheese Theme, everyone has made a recipe that contains wine, cheese or both. We have some sweets for you, some savories and even a refreshing wine-based beverage! Would this work for a port jelly as well? If so would you need to reduce the sugar? Karem, I’ve read that you really can’t substitute a dry pectin for a liquid easily…one is put into the mixture while it’s cooked and the other added at the end and right before canning. Have you checked online? Most brands are readily available for shipping from Amazon if that would help. If you come up with a plan, please do let me know! This jelly looks incredible, I just love the deep ruby red color. I recently made a champagne jelly that I loved so much I decided I wanted to make all sorts of wine and boozies jellies! This will be my next one. That’s where I’m at too! My trouble is I give away a lot too…mine is already gone. Sob. I don’t like to drink pinot noir but I bet I’d like this jelly on my cheese plate! I love it with almost any red wine so use one you like. I’ve only not made it with a Rose so that’s next for me! Of all the things wine I dream about, I never thought about a jelly. What an incredibly great idea. It would be exquisite on a wine and cheese platter with some nice salty crackers! We should put this on our list for the next time; as hard as it is for us to actually make those ‘next times’ work! Aha! Pinot Noir from my backyard– Monterey County! I love that spoon! It looks like it was looted from a dragon’s lair (I mean that in a good way). Fancy! I love canning, and do several times a year. I think I have something new to try with my canning equipment (I have a Ball Auto Jam/Jelly maker and an Automatic Canner as well). Beautiful post, as always. When I had the boutique I mentioned in the post I sold those spoons and more that were hand made locally. SO glad I kept a couple for myself! With your equipment this should be a piece of cake; it was easy for me with my cobbled together pieces. Thanks so much! I’ve done just a bit of jam-making and canning – enough to be brave enough to try this fabulous-looking recipe. As an appetizer, this is the ultimate in my book. And now that I have your good advice, I’m going to set aside my small glass before I pour the wine into the jelly. What a great idea to add a reduction back into the jelly. And I want that jelly. Really. I bet it would be dreamy layered on top of panna cotta or folded into whipped cream for a fast “mousse.” Can’t imagine there are many ways that *wouldn’t* be good. Even as a glaze for ham or something. Yum! What am I doing wrong? 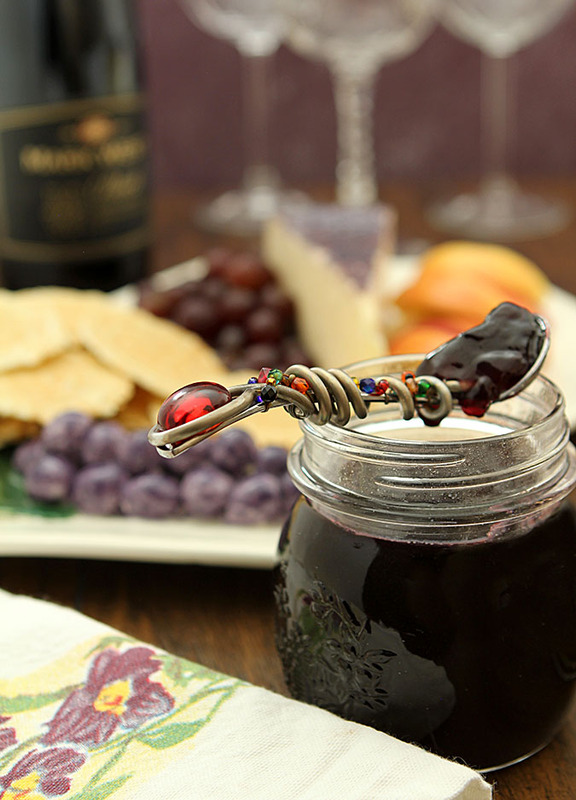 I cannot get the Pinot Noir Red Wine Jelly recipe to come up. I just get a grey screen with lots of little diamond shapes. Is there a secret? I’ve fixed one issue and the page should be viewable again; so sorry for the inconvenience…particularly with this recipe that I just love and wanted to share! 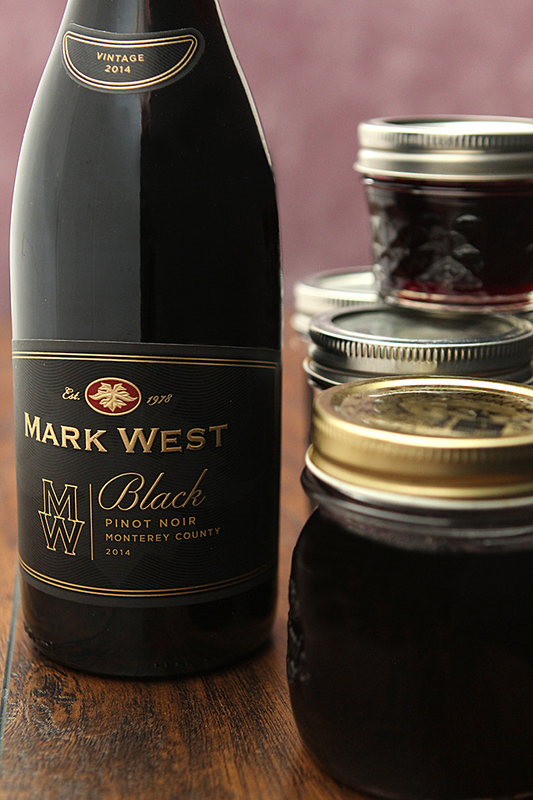 I’m dreaming up all sorts of ways to use this Pinot jelly—but with mascarpone on crackers would be the first to try! I’d love to make this for gifts–I know my friends would love it! I know they will too! I gave friends a jar for Easter; it’s already gone and she wants to make some more with me! I’m adding this to my list of ‘Must Make Soon’ recipes!! I love this! What a terrific idea to make. It is really good Susan; tastes just like the product I used to buy which I loved. I’m very excited to now be able to just make a couple of jars when the mood strikes me; it’s SO easy! I’m thinking of making a batch to save for hostess / little birthday gifts too! Just wondering what the wine should be reduced to, in the recipe there is a ? instead of a measurement. I love making jelly and have not tried a wine one yet. This will be delicious. Thankyou. I was just trying to make it more fun by leaving that information out!! Or…the software I use for inputting recipes apparently can not translate measurements for thirds so it threw out a question mark; it should be reduced to 1/3 cup and I’ve fixed the recipe too. Thanks for the heads up!